The issue that is clicking with voters during this Presidential campaign is the economy. Despite the fact that America is in a Recovery while the rest of the world struggles economically, conservatives are working hard to maximize the fear of another economic disaster. There is one factor that helps Republican agenda and that is oil prices. The cost of oil is a major factor in our economy and conservative oil executives are acutely aware of the impact the price of gasoline has on the psyche of the American consumer. Oil companies (exploration, refining, distribution, and trading of oil products) cannot completely control oil prices, but they can artificially set prices high or low for periods of time to influence the market and our economy. Cut the revenue for the government, while increasing spending causing a massive debt, starting two wars, and wrecking the economy. 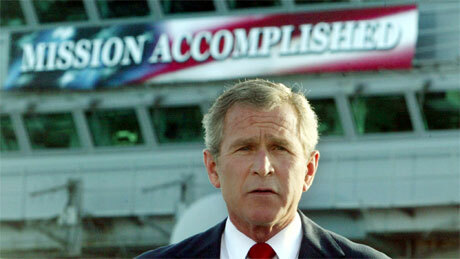 George W. Bush MISSION ACCOMPLISHED! A historical look at the past eight years of oil prices indicates an interesting correlation to a conservative agenda. Shortly before the 2004 Presidential election cycle average U.S. gas prices were under $2.00/gallon. That worked well for the re-election of George W. Bush who needed the economy to seem well-managed under his administration. In 2005 and 2006, gas prices peaked during the summer at just under $3.00/gallon, but prices dropped rapidly just before the 2006 Congressional elections which boosted the image that conservatives were on track with the economy and the two wars in the Middle East. In 2007, oil prices jumped up again during the summer and then continued to go higher during the Presidential campaign. Oil companies made massive profits and high oil prices reminded skeptical Americans that we needed to have a military presence in the Middle East to keep oil supplies under American control. This strategy backfired on conservatives as unregulated banking practices brought the American economy to the brink of its second Depression. As it became obvious that is was conservative’s worship of private business and lack of government regulation that caused the disaster, high prices at the pump just made the problem bigger. President George W. Bush was looking incompetent and Republican candidate John McCain was sinking fast in the polls. 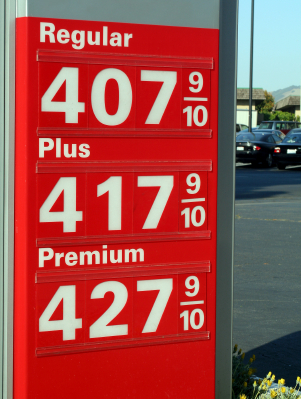 Suddenly the U.S. average price of a gallon of gasoline dropped from almost $4.00 to just over $1.50. This occurred in the middle of the summer when gas prices are usually the highest. The historic drop in gas prices didn’t rescue McCain’s bid for the Oval Office, nor did pulling Sarah Palin out of obscurity. However, low gasoline prices did help to thwart the rapid growth in hybrid and fuel efficient cars that caused a significant drop in the demand of oil in America. Low gasoline prices helped derail many efforts to make alternative energy viable causing losses to those who took a big risk in trying to end dependency on oil. While oil prices increased in the Spring of 2008, gasoline remained steady at around $2.75/gallon with little variation between summer and other seasons until after the 2010 Congressional elections. It was also at this time that the worst of the economic fallout hit the United States. Unprecedented job losses and business failures seemed to stem the up/down cycles of gasoline prices. That steady trend ended after the Congressional elections with gasoline prices climbing and remaining over $3.00/gallon for the duration of the 2012 Presidential campaign. This coincides with conservatives efforts to put the worst possible face on America’s economy. Conservative oil executives like David Koch have worked hard to influence the outcome of this year’s elections. Oil executives are spending hundreds of millions of dollars to elect conservatives, and gasoline at almost $4.00/gallon serves their agenda well, and gives them a ready supply of cash. The problem is that gasoline prices at the current levels will allow alternative energy blossom again, so after the election gasoline prices must come down. If President Obama is re-elected the oil companies will be forced to help improve the economy or face a continued decline in demand. 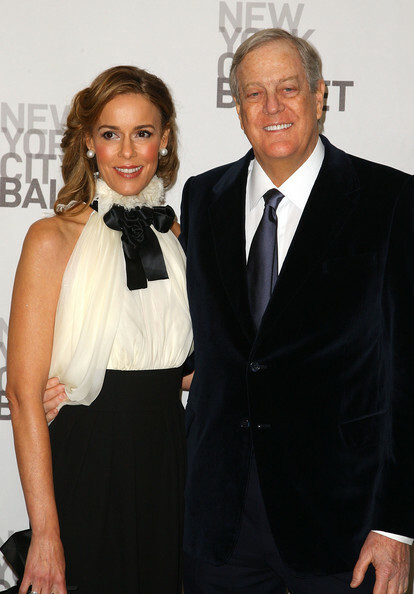 David Koch certainly doesn’t want to be put in that position.